Turkey in Europe and Greece. 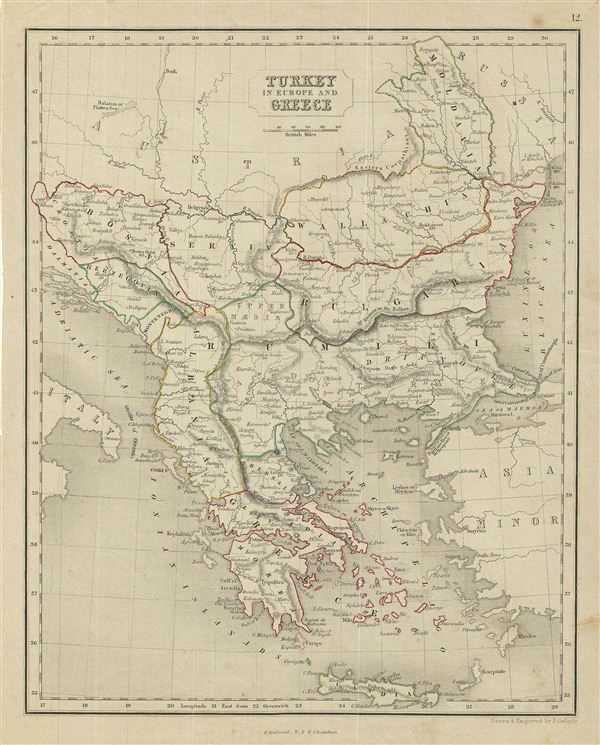 This is a fine example of the 1845 Chambers map of Greece, the Balkans, and the eruopean Part of Turkey. It covers from Moldova to Crete and from the Adriatic to the Black Sea. The modern day states of Greece, Albania, Moldova, Bosnia, Croatia, Serbia, Bulgaria & Romania are included. Divided and color coded according to regions and territories, the map identifies various cities, towns, islands, rivers, and an assortment of additional topographical details. This map was drawn and engraved by J. Gellatly.